Use flashlights as alternativesto candles or torch lights when decorating walkways and yards. They are much safer for trick-ortreaters, whose costumes may brush against the lighting. Dried flowers, cornstalks and crepe paper are highly flammable. Keep these and other decorations wellaway from all open flames and heat sources, including light bulbs, and heaters. 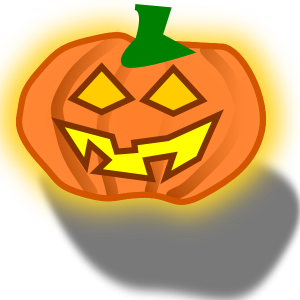 It is safest to use a flashlight or battery-operatedcandle in a jack-o-lantern. If you use a real candle, use extreme caution. Make sure children are watched at all times when candles are lit. 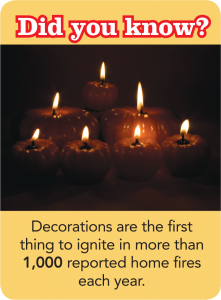 When lighting candles inside jack-o-lanterns, use long, fireplacestyle matches or a utility lighter. Be sure to place lit pumpkins well away from anything that can burn and far enough out of way of trick-or-treaters, doorsteps, walkways and yards. Remember to keep exits clear of decorations, sonothing blocks escape routes.